File History in Windows 8.1 stores snapshots of your files, taken every hour, unless you change the frequency. If you’ve been working on a spreadsheet for the past six hours and discovered that you blew it, you can retrieve a copy of the spreadsheet that’s less than an hour old. If you’ve been working on your résumé over the past three months and decide that you really don’t like the way your design changed five weeks ago, File History can help you there, too. f you’re accustomed to the Windows 7 way of bringing back Shadow Copies, you need to unlearn everything you think you know about bringing back old files. Windows 8.1 works differently. 1Bring up the Control Panel by right-clicking in the lower-left corner of the screen and choosing Control Panel. 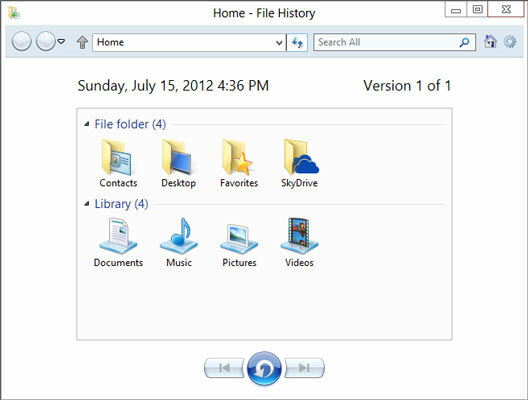 Click or tap System and Security, File History, and then Restore Your Files with File History. 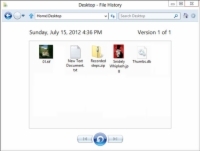 The File History Restore Home page appears. 2Navigate to the location of the file you want to restore. 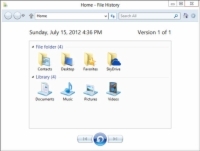 You can use several familiar File Explorer navigation methods inside the File History program, including the up arrow to move up one level, the forward and back arrows, and the search box in the upper-right corner. 3Check the time and date in the upper-left corner. If that’s the time and date of the file you want to bring back, tap and hold or right-click the file, then choose Restore or (usually easier, if you have a mouse) simply click and drag the file to whatever location you like. You can even preview the file by double-clicking it. If this isn’t the right time and date, at the bottom, tap or click the left arrow to take you back to the previous snapshot. 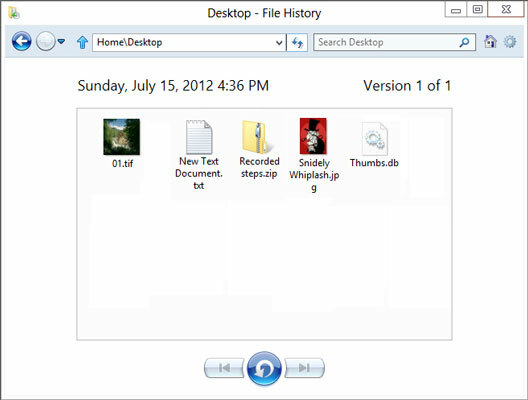 Tap or click left and right arrows to move to earlier and later versions of the files, respectively. 4If you want to restore all the files you can see, at any given moment, tap or click the arrow-in-a-circle at the bottom of the screen. You’re given options to replace the files (which deletes the latest version of each file) or to choose which files you want to replace.